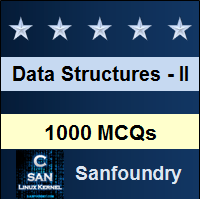 This set of Data Structures & Algorithms Multiple Choice Questions & Answers (MCQs) focuses on “Maximum Flow Problem”. 1. What does Maximum flow problem involve? Explanation: The maximum flow problem involves finding a feasible flow between a source and a sink in a network that is maximum and not minimum. 2. A network can have only one source and one sink. Explanation: A network can have only one source and one sink inorder to find the feasible flow in a weighted connected graph. Explanation: Vertex with no incoming edges is called as a source. Vertex with no leaving edges is called as a sink. 4. Which algorithm is used to solve a maximum flow problem? Explanation: Ford-fulkerson algorithm is used to compute the maximum feasible flow between a source and a sink in a network. 5. Does Ford- Fulkerson algorithm use the idea of? Explanation: Ford-Fulkerson algorithm uses the idea of residual graphs which is an extension of naïve greedy approach allowing undo operations. 6. The first step in the naïve greedy algorithm is? Explanation: The first step in the naïve greedy algorithm is to start with the zero flow followed by adding edges with higher values. 7. Under what condition can a vertex combine and distribute flow in any manner? Explanation: A vertex can combine and distribute flow in any manner but it should not violate edge capacities and it should maintain flow conservation. 8. Find the maximum flow from the following graph. Explanation: Initially, zero flow is computed. Then, computing flow= 7+1+5+2=15. Hence, maximum flow=15. 9. A simple acyclic path between source and sink which pass through only positive weighted edges is called? Explanation: Augmenting path between source and sink is a simple path without cycles. Path consisting of zero slack edges is called critical path. 10. In what time can an augmented path be found? Explanation: An augmenting path can be found in O(|E|) mathematically by an unweighted shortest path algorithm. 11. Dinic’s algorithm runs faster than the Ford-Fulkerson algorithm. Explanation: Dinic’s algorithm includes construction of level graphs and resLidual graphs and finding of augmenting paths along with blocking flow and is faster than the Ford-Fulkerson algorithm. 12. What is the running time of an unweighted shortest path algorithm whose augmenting path is the path with the least number of edges? 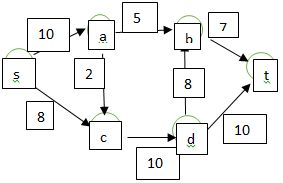 Explanation: Each augmenting step takes O(|E|) using an unweighted shortest path algorithm yielding a O(|E|2|V|) bound on the running time. 13. Who is the formulator of Maximum flow problem? Explanation: The first ever people to formulate Maximum flow problem were T.E. Harris and F.S. Ross. Lester R. Ford and Delbert R. Fulkerson formulated Ford- Fulkerson algorithm. 14. What is the running time of Dinic’s blocking flow algorithm? Explanation: The running time of Dinic’s blocking flow algorithm is O(V2E). The running of Ford-Fulkerson algorithm is O(E max |f|). 15. How many constraints does flow have? Explanation: A flow is a mapping which follows two constraints- conservation of flows and capacity constraints.